Oxford English Dictionary on slats and spindles:-- For slat/slats, see below; for spindle/spindles, the results are, at best, mixed. spindle n. rod or pin used to twist, wind, or hold thread in spinning. Before 1225, alteration (with added "d" after "n", as in sound and thunder) of Old English (before 800) spine], related to spinnan to SPIN; for suffix see -LE'. Old English spinet is cognate with Old Frisian spindel, spindle, Old Saxon spinnila, and Old High German spinila (modern German Spindel). -- v. (of plants, etc.) grow tall and slender. 1577, (implied earlier in spindling 1441-42); from the noun in the sense of a stalk, stem, or shoot of a plant. -- spindly adj. too tall and thin. 1651, formed from English spindle, n. -y1. Source: Barnhart Dictionary of Etymology, Robert K. Barnhart, editor New York: H. W. Wilson, 1988, page 1046. 4. a. A long narrow strip of wood or metal, used for various purposes. "Nailing of slats, old hoops, or laths, on the two sides and fore end of the cart." London: Printed for R. Davis, Volume 2, page 189. "The slats of a cart or a chair ... ". Springfield, MA: G. and C. Merriam, page 1039. [Biography of Civil War surgeon Robert Ware], "The bulk of those now in bed must have lain on the slats of the bedstead." "Arranged in transverse rows, like slats on a blind". New York, Scribner's Sons, 1885, page 28. "When the floors are of split bamboo, ... the interstices between the slats are many and often large." Edinburgh: W. Blackwood and Sons, 1890, page 277. Are These the Roots of the Arts and Crafts Spindles? Square spindles are a product of the table saw. Lathes -- foot lathes -- have been around for centuries, and make producing round spindles easy. The original Morris chair, not by William Morris, but an old carpenter at Hurstmonceaux, Sussex by name Ephraim Colman. Morris & Co Armchair, 1885-90., has round spindles. Frank Lloyd Wright starts out with round spindles; for example the high-back chairs in Wright's own dining room of 1895 had spiral spindles; he replaces them later with square ones. "William Morris pleaded well for simplicity as the basis of all true art. Let us understand the significance to art of the word -- SIMPLICITY -- for it is vital to the Art of the Machine." Source: Click here for Wright's declaration about the use of machines; portions of the text in the link adapted from Tod M. Volpe, Beth Cathers, Alastair Duncan, Treasures of the American Arts and Crafts Movement, 1890-1920 New York: Harry M. Abrams, 1988, page 49. "My God ... is machinery, and the art of the future will be the expression of the individual artist through the thousand powers of the machine, the machine doing all those things that the individual workman cannot do, and the creative artist is the man that controls all this and understands it. Source: From the Ashbee Journals, December 1900 (ms. in Cambridge University Library), as cited by Tod M. Volpe, Beth Cathers, Alastair Duncan, Treasures of the American Arts and Crafts Movement, 1890-1920, New York: Harry M. Abrams, 1988, page 49. "No practice by any European architect to this day has influenced mine in the least"
is not only mean-spirited and unchivalrous, but patently untrue. As a definite link between the furniture and the architecture these square vertical spindles are indispensable in the Prairie School interiors. To create visual privacy without bottling up the ever flowing free space, they formed in screens between piers, walls, cabinets and ceilings. When repeated in the tall chair backs, and beneath the tables, they form such a complete bond that it is difficult to tell which belongs to the house and which belongs to the movable furniture. Sources: Wright quote: Frank Lloyd Wright, A Testament New York, 1957, page 205, as cited by Tod M. Volpe, Beth Cathers, Alastair Duncan, Treasures of the American Arts and Crafts Movement, 1890-1920, New York: Harry M. Abrams, 1988, page 49; Donald Kalec, "The Prairie School Furniture", The Prairie School Review 1, no 4, 1964, page 6; Donald Hoffmann, Frank Lloyd Wright's Robie House: The Illustrated Story of an Architectural Masterpiece New York Dover Publications, 1984, page 73. Square spindles have flat surfaces on all four sides, and while flat surfaces can be made with planes, their production is labor intensive. Among others, John Freeman Crosby observes, quite insightfully I think, that arts and crafts designs, with their straight, rectinlinear lines, are a product of the power machine. Thus the outcome of the "flap" about producing Arts and Crafts furniture with power machines -- rather by hand, as stronlgly urged by the purists - that emerged around 1900 is a for-gone conclusion. Rectilinear and circular saws are a natural blend. "The idea of geometrically shaped slats as a decorative motif was probably derived from the Japanese". Sources: David A. Hanks, The Decorative Designs of Frank Lloyd Wright New York: Dover, 1979, pages 37-43; Yuko Kikuchi, Japanese Modernisation and Mingei Theory Cultural Nationalism and Oriental Orientalism New York: Routledge, 2004, 2006; and Yuko Kikuchi, "The Mingei Movement", in Karen Livingstone and Linda Parry, eds, International Arts and Crafts London: V&A Publications, 2005, pages 296-310. Let me add, parenthetically, in 2005, in London's Victoria and Albert Museum, I toured the Arts and Crafts exhibit, and was mightily impressed with everything I saw. However, as with many things that happen to you in life, my background information was wanting, and when I went through the Japanese Arts ad Crafts section, did not get the kind of impression I would today, because now I am more "tuned in" about what to look for. Stair railing with lattice-work design in Frank Miles' house, in the Chelsea district of London, 1879, exhibits the impact of Japonisme that the architect-designer, Edwin William Godwin, is famous for. Arthur H. Mackmurdo's fence for the Century Guild stand at the Liverpool International Exhibition of 1886 is another early instance of this idea in the West. Of particular significance for the emerging Modern Movement are the visions of a new spirit in furnishing, one that shrugs off the excesses of the styles of the Victorian era. 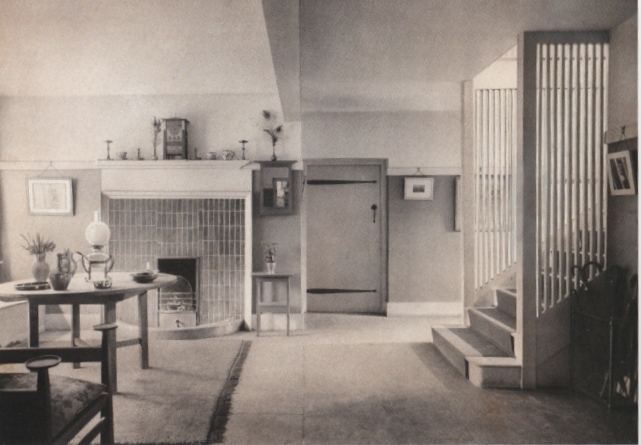 An example of this new spirit is the entrance of Voysey's own home, The Orchard, Chorley Wood, Buckinghamshire, of 1899. Spindles and slats are integral to Wright's Prairie Style architecture. Frank Lloyd Wright began designing tall-back chairs with squared vertical spindles in the 1890s, but according to Tod M. Volpe and Beth Cathers, Wright disputes his indebtedness to the English Arts and Crafts movement for the root of some of his design ideas. Frank Lloyd Wright's relationship to the Arts and Crafts Movement, both indigenous and European, is not a simple one. Not unlike Augustus Pugin or William Morris or Ernest Gimson -- all of whose reformist beliefs and pracitces generate a resurgence of handicraft ideals when the negative aspects of the Industrial Revolution manifest themselves in late-Victorian England -- Wright favors of simple unadorned forms. He differs sharply, however, in how these should be achieved. As he state in the famous speech, "The Art and Craft of the Machine," addressed to the Chicago Arts and Crafts Society at Hull House on 6 March 1901, "William Morris pleaded well for simplicity as the basis of all true art. Let us understand the significance to art of the word -- SIMPLICITY -- for it is vital to the Art of the Machine." Source: Frank Lloyd Wright, "The Art and Craft of the Machine," in Catalogue of the Fourteenth Annual Exhibition of the Chicago Architectural Club (Chicago Architectural Club), 1901, no pagination; as cited by Tod M. Volpe, Beth Cathers, Alastair Duncan, Treasures of the American Arts and Crafts Movement, 1890-1920, New York: Harry M. Abrams, 1988, page 49. The Arts and Crafts philosophy at the turn of the century remained locked into the handicraft ideal: in order to be "honest," an item had to be handmade. Wright never came to terms with the Mission furniture of the Stickleys, Charles Rohlfs, and others. It is not incompatible with his interiors, but he felt intellectually superior to it; in its rudimentary construction it is conceptually a remnant of the 19th-century, whereas his, made by machine, is firmly in the 20th. "My God ... is machinery, and the art of the future will be the expression of the individual artist through the thousand powers of the machine, the machine doing all those things that the individual workman cannot do, and the creative artist is the man that controls all this and understands it." Source: From the Ashbee Journals, December 1900 (ms. in Cambridge University Library)as cited by Tod M. Volpe, Beth Cathers, Alastair Duncan, Treasures of the American Arts and Crafts Movement, 1890-1920, New York: Harry M. Abrams, 1988, page 49;as cited by Tod M. Volpe, Beth Cathers, Alastair Duncan, Treasures of the American Arts and Crafts Movement, 1890-1920, New York: Harry M. Abrams, 1988, page 49. Wright proves to be correct in his anticipation of the machine's future, but his refusal to acknowledge the impact of the Arts and Crafts Movement on his own evolving furniture style is readily disputed. A look at contemporary periodicals, The Studio, or, in America, House Beautifulor The Western Architect, to which Wright has access, shows that-- before Wright's spindle designs -- British architects and designers such as Voysey, Gimson, and Ashbee design furniture with ladderback, spindle, and splat components, who -- as you can see above, in turn -- pick up on the designs of Godwin. With this evidence, Wright's later claim that "No practice by any European architect to this day has influenced mine in the least" is untrue. Source: Frank Lloyd Wright, A Testament, New York, 1957, p.205 as cited by Tod M. Volpe, Beth Cathers, Alastair Duncan, Treasures of the American Arts and Crafts Movement, 1890-1920, New York: Harry M. Abrams, 1988, page 49. The new woodworking machines of the day, which creates the conditions for furniture to be constructed rapidly and inexpensively, helps form Wright's notions of an aesthetic of furniture, defintiely radical for the era. 2) as an architectural screening device that allows space to flow through while still an integral part of a chair. The earliest chairs known to make use of vertical slats are probably those designed for his own dining room. "built on slender lines, tall, graceful, and showing ... quaint refinement. The use of light spindles instead of broad bars in the backs of chairs and settles gives an effect that is rather more ornate than that of the heavier pieces". Note that Stickley first markets the famous Morris chair in 1901, a chair designed by his first designer employee, Lamont Warner. Stickley's spindle furniture shows the high level of sophistication Craftsman designs can reach, and its refinement echoes the larger architectural refinements of the spacious Wrightian home. "It is often impossible to say with complete certainty when a particular Stickley design was first introduced. This, however, is not the case with his line of furniture with spindles"
"Since spindles are usually thought of as round, rather than square, 'spindle' may seem to be the wrong name to apply to this furniture [style]. However, it is the name Stickley used to describe it." According to Cathers, Stickley patents his spindle furniture on August 8, 1905. Furniture World August 17, 1905, reports that Stickley had been granted patent #37507 and #37508 for his spindle chair frames. Stickley's high-backed armchair with spindles appears first in The Craftsman, September 1905, and then frequently for about 18 months. The first catalog appearance is 1906; in Stickley's 1907 "Descriptive Price List" it is described as a "hall chair." The chair echoes the forms of normal-size dining-room armchairs, but in actuality is much larger. The design is clearly more delicate than Stickley's characteristic "mission" look. The vertical spindles emphasize the strong upward thrust of these pieces, and therefore may be said to show a definite relationship to Mackintosh's high-back chair designs. There is, of course, the strong influence of Frank Lloyd Wright on Stickley's spindle chairs. By 1909 Stickley was phasing out his spindle designs. He did include a spindle armchair in that year's catalog, but it was 10 inches shorter than the earlier version and the spindle below the arms had been replaced by Stickley's characteristic stretcher arrangement. Since Stickley's spindle pieces were made for such a brief period, it is likely they did not achieve great commercial success. Pieces are found today only rarely. The use of light spindles instead of the broad bars in the backs of chairs and settles gives an effect that is rather more ornate than that of the heavier pieces, although it is in reality quite as structural and simple. His spindle furniture gave Stickley elegant forms that, unlike the more costly to produce inlaid pieces, were readily accommodated to his factory's mechanized production capacities that did not require the services of an outside contractor. It gave him a cost-effective way to bring a measure of "quaint refinement" to Craftsman furniture, and was thus one line of defense in his campaign to counter the ear­lier criticisms that his work was too massive. The spindle line was to flourish only during the first four or five years of the Standard Stickley era, and by the end of the decade it would be dropped from production. L. & J.G. Stickley make its own version of this spindle chair in 1910, but rather than spindles, it had thin lightweight slats. Sources: Adapted from David M. Cathers Gustav Stickley New York: Phaidon, 2003, page 133; and Furniture of the American Arts and Crafts Movement New York: New American Library, 1982, page 148. The development of the L. & J.G. Stickley Handcraft pieces signaled a new matu­rity in their work. 4) the Glasgow School and C. R. Mackintosh. The infusion of these disparate influences, especially that of Prairie-school architects, revitalized the simple mission style and pushed the firm into a new prominence in the marketplace. The full realization of this new aesthetic would not be achieved for several years, but the work reproduced in the first Handcraft catalog illustrates the new directions. Donald A. Davidoff, "Innovation and Deivation: The Contribution of L. & J.G. Stickley to the Arts and Crafts Movement", in Donald A. Davidoff and Stephen Gray, Innovation and Deivation: The Contribution of L. & J.G. Stickley to the Arts and Crafts Movement By Township of Parsippany-Troy Hills, Craftsman Farms Foundation, 1995, page 33. Gus designed very few new pieces after 1910 (his last innovative designs were his spindle pieces of 1904-5) and relied instead on the simplification of his already existing designs. Though designed on simple lines and void of decoration it is an expensive chair to build because of the absence of rectangular joints. The joints are all on a bevel, as can be seen by consulting the drawing. But when the pattern began to be copied the bevel joints were done away with, by which procedure the most essential feature, the rearwood droop of the seat, was abolished. Also were the number of spindles reduced a few at a time until there came to the front an individual more venturesome than the rest, as in figure 4, eliminating them en- tirely. All this of course was done in the interest of cheapening the product, in process of which considerable may be done and the public be none the wiser. We start a Morris chair with sixteen spindles to a side, and not one customer in a dozen discovers the difference when some "cheapener" cuts the number in half. Given general simili- tude to the original, and the average person will deem them practically the same. Source: Paul D Otter, "The Morris Chair" from Paul D. Otter, Furniture for the Craftsman: A Manual for the Student and Mechanic, 1914, 1923. (According to the Preface, the drawings and the text originally appeared in issues of the trade journal, The Building Age, before 1914, a fact that I confirmed by obtaining photocopies of these articles. The articulation of the open space of Wright's interiors was often achieved by the movable and built-in furniture as well as by the image to come) had an important function in creating the secondary space of the room. The elongated slatted backs served as screens that defined the eating area, creating a room within the room. While none so focus on "carefully calculated horizontality" to evoke the "long horizon line of the prairie [itself]" as would the soon-to-be-produced Prairie settle, many of the pieces illustrated here do rely on the square spindle, found so ubiquitously in the work of the Prairie School architects. Kalec points out, these spindles served "as a definite link between the furniture and architecture" in that they supported "a sense of visual privacy without bottling up the ever free flowing space. " As to the chair frame there is a field of change of style from Fig. 193. Using the same seat plan create a different treatment under the arms either by square spindles or three or four slats or flat balusters under the arms. Donald A Davidoff, Early L. and J.G. Stickley Furniture: From Onondago Shops to Handcraft New York: Dover, 1992, page xiv.